You’re ready to start your keto diet and you need to stock your pantry and kitchen with keto staples and essentials. If so, you will find everything you need to stock your pantry for a ketogenic diet, including a low-carb grocery list, keto snacks, and keto-friendly sweeteners. Well, the first thing to do like anything that requires change is preparation. Starting a ketogenic lifestyle is not easy. But if you are armed with the right resources, the right mindset and a support system, you will be more likely to succeed at it. The importance of planning meals ahead of time and having the right food in the pantry cannot be overemphasized. In addition, I find that having kitchen tools to make it easier to accomplish your eating goals quickly and easily is invaluable. When preparing to start a ketogenic diet, here are a few tips that I have found really helpful. Understand the carb content of different foods. Check out these infographic charts which are super helpful. Remember that carbs are not just found in your typical bread and pastry. Many fruits and veggies also contain a fairly high amount of carbohydrates as well. Invest in a good keto recipe book or a meal plan program (even better!). A meal plan I highly recommend The Keto Beginning by Leanne Vogel. It’s a truly resourceful beginner’s guide which also comes with a 30-day Meal Plan with Recipes. Read my review here. Preparing for a ketogenic diet is not complete without stocking up on a few essential ingredients that you are more than likely to use. Win Up To $10,000 In Cash Prizes While Getting Healthy. PLUS get $50 Prize Boost from 12/27/18 through 1/3/19! Click Here To Join HealthyWage Now – Get Paid For Your Weight Loss! Coconut flour is one of the most suitable low-carb flour options which is perfect for creating delicious keto-approved baked goods. One-fourth cup of coconut flour contains all of 60 calories, 2.5g of fat, 6g of protein and 7g net carbs. Another great substitute for flour is almond flour, which falls under 3g net carb per 1/4 cup. The best almond flour is obtained after blanching, drying and grinding of almonds into a fine flour. Cream cheese is one of my favorite keto-friendly ingredients to use. It can be used in baking and cooking almost anything and adds depth and richness to the taste. Keep an eye out on the label for the carb count as it can vary based on the brand. Another versatile dairy that’s enjoyable and a staple in a keto kitchen, especially great to have as a topping for low carb taco. I implore you to not be afraid of eating butter. It’s one of the easiest ways to consume fats and reach ketosis. Ketosis occurs when you not only restrict carb intake but you should also increase your fat intake. Aim for grass-fed butter or even grass-fed ghee to get the full nutritional value. You will need a moderate amount of protein to stay in ketosis and burn fat. Fatty animal meats such as pork and lamb, as well as chicken and beef, are good options. Eggs are also a good source of protein and versatile for easy breakfasts and snacks. If you are intending on making fat bombs or keto-friendly desserts, you will most likely use cacao powder in your recipes. You will need to opt for unrefined cacao powder which is not processed and will be unsweetened. Organic Cacao Butter is great for many keto recipes but especially for making fat bombs. You can even use it for your morning butter coffee. As much as we would all love to say goodbye to anything sweet and indulgent, it’s tough especially if you were heavily relying on sugary food in the past. However, the good news is that you can enjoy the occasional treat without ruining your ketosis. There are a number of artificial sweeteners that are organically made and do not contain harmful ingredients. You will find that a lot of keto desserts call for erythritol or stevia. And for good reason. Erythritol and Stevia (100% Pure Stevia) are both keto-friendly sweeteners and the healthiest alternatives to sugar and artificial sweeteners. I would recommend Erythritol since it closely resembles sugar in taste. Another great natural sweetener is Monk Fruit . Yasss! It’s all about saving time and sanity when it comes to preparing the right food and losing weight. Give me anything that will save me time, and I’ll take it! Have you wondered which fried foods you can and can’t eat on a low carb high-fat diet? It not, you probably will at some point in your keto journey. But you will want to avoid unhealthy oils such as canola or vegetable, which are commonly used in deep frying, as well as that high-carb coating such as flour or breadcrumbs. And that’s where the AirFryer comes in. With an AirFryer, you get the same crispy tasty chicken wings or crusted pork chops without the unhealthy oils. Another bonus is that you won’t have to deal with that sick feeling you get after eating greasy food. A food processor is one of the most common kitchen gadgets you probably already own but probably never use right? Well, not while on a keto diet. The lazy way to have a low carb breakfast (or any meal) on the go is a smoothie. Seriously! Be sure to check out this list of low carb smoothies (all under 7g net carbs). It’s also handy for ricing cauliflower and prepping other ingredients for cooking. Oh, the spiralizer. It’s probably one of the most underrated affordable kitchen tools for any clean eating fanatics. It’s so useful for prepping zucchini, which is one of the most commonly used low carb vegetables on a ketogenic diet. When you crave that spaghetti or any hearty meal that requires a carb-heavy base, zoodles (zucchini spaghetti) can save you. Don’t like zucchini? Not to worry. There are a ton of delicious creamy recipes you can make to enjoy this dish (a.k.a effectively mask the taste of zucchini). You can also use the spiralizer to make noodles out of the stems in broccoli and cauliflower too. The Instant Pot is all the hype these days – and so it should be. You can make almost anything from savory to sweet recipes in this popular appliance. And at a speedy rate. If you lead a busy lifestyle, you will want to try cooking and freezing your meals for easy convenient weeknight dinners. You can even make and freeze some snacks and breakfasts to have on-the-go. While you are on the hunt for meal prep containers, I recommend getting BPA-free or glass containers (because who wants to microwave and eat plastic? Eek!). Yes, you can collect recipes on Pinterest but sometimes, you just don’t have the time and energy to search for hours. And some days, that will test your motivation to stick to this way of eating. 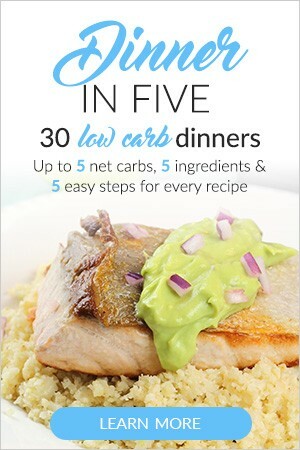 List of Popular Keto Recipe Books . Our mindset about food and healthy eating can make or break us. Staying inspired whether that be through reading or joining a support group is going to help you stay the path. If you haven’t watched The Magic Pill on Netflix, do it. There are also some incredible reads such as The Obesity Code and Dr. Berg’s New Body Type Guide . Woo! Thanks for sticking with me to the end! I hope I’ve given you the basic pantry staples and some ideas to make losing weight even easier on the keto diet. Feel free to share this on Facebook, Pinterest or Twitter with a friend who might find it helpful.